The top chart is from the Gallup Poll -- done between February 1st and 10th of a random national sample of 1,044 adults, with a margin of error of 4 points. 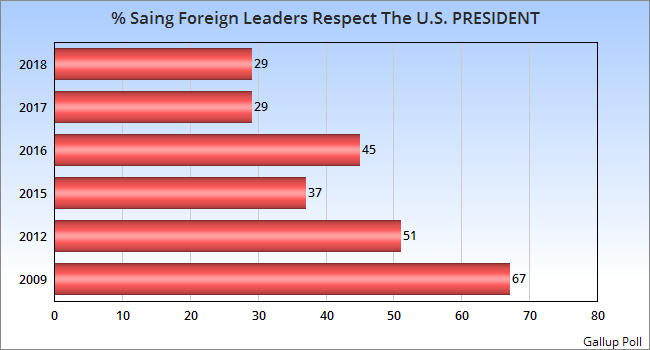 It shows that the American public is very aware of the lack of respect for Donald Trump among world leaders. Only 29% believe world leaders respect him -- lower than any percentage since the last couple of years of the Bush Administration (when only 21% or 22% thought world leaders respected our president). The second chart is from a Gallup Poll survey in over 130 countries. It shows that while respect for our president has gone down among both our allies and non-allies, it has dropped the most among our allies. 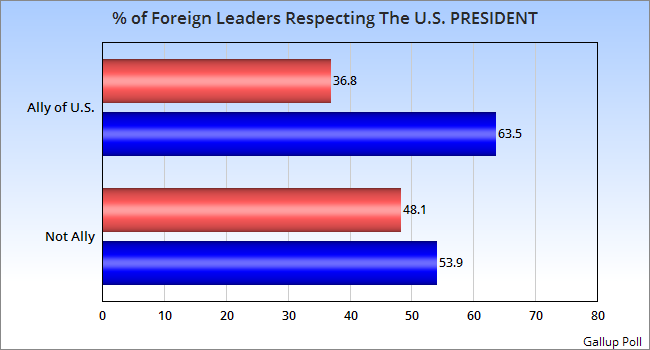 Among our allies, respect for the president has gone from 63.5% to 36.8% -- a drop of 26.7 points. Among non-allies, respect has dropped from 53.9% to 48.1% --a drop of 5.8 points. Trump has seriously damaged the U.S. reputation in the world -- and sadly, the most damage has been among our allies. Many of them don't believe that can trust us any longer.